Relations between Moscow and Delhi are based on the sameness or similarity of both countries’ approaches to the fundamental problems of global development. 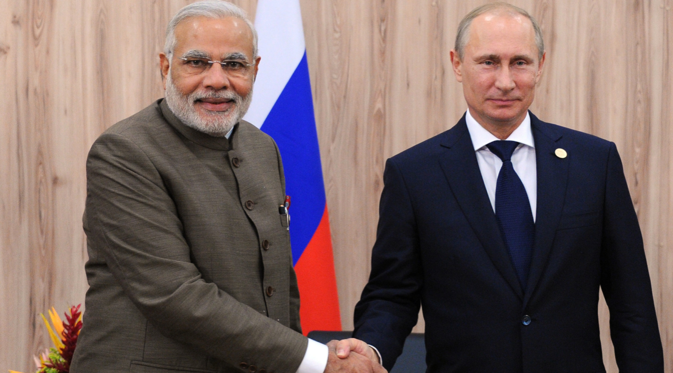 The tradition of close, friendly relations between Russia and India is largely inherited from Soviet-Indian relations, established after Indian independence. The Soviet Union and India had common or coinciding positions on most of the important issues in world politics. The USSR rendered important assistance to India during the course of the 1971 Indo-Pakistan war. As a result of India’s great victory, the newly independent state of Bangladesh was formed in place of East Pakistan. This was an important stage in India’s history that to a significant degree laid the foundation for the transformation of the state into a great power. At present, relations between Moscow and Delhi are based on the similarity of both countries’ approaches to the fundamental problems of global development. Their conformity of viewpoints on the necessity of the construction of a “new world order” after the era of the Cold War is also of considerable importance. In the Joint Declaration that was signed in October 2000, as a result of Vladimir Putin’s visit to Delhi, Russia and India underscored their determination to act together in the interests of constructing a multipolar world based on the sovereign equality of all countries, territorial integrity, and non-interference in internal affairs. Both countries, conducting external economic activities aimed at direct involvement in the process of global and domestic development through the modernization and improvement of the competitiveness of their own economies, are motivated by the practicability of protesting those aspects of economic globalization that have negative effects on the conditions of a country with a developing economy. Accordingly, during voting at the UN General Assembly sessions both countries show solidarity on the most important resolutions related to the problems of global development, strategic stability, and international security. Major states with rapidly growing economies such as China, Brazil, and South Africa also share a position similar to that of Moscow and New Delhi. It is no coincidence that they have formed a new organization – BRICS, which is assuredly harnessing their common interests in the international arena. India’s principled position on the formation of a modern model of international relations is based on the political-philosophical conception of “unity in diversity” according to which world politics must be built on the foundation of consensus among states acting independently and not upon the dictate of one or several major powers. Such an approach by Delhi coincides with the Russian vision of solutions to modern international issues. The two countries also have close positions concerning the issue of combating terrorism. One reason for this is that India and Russia have become victims of terrorism with the same origin and both countries have to defend the unity and integrity of their multinational societies from the challenges of internal as well as external forces. Moscow and Delhi have designated the status of their relations as “privileged political partnership” in bilateral documents. All the same, the commonality of their positions in a wide range of the most important global international problems outpaces by far their bilateral cooperation in the trade and economic sphere, which, with the exception of the cooperation in the areas of military technology and collaboration in the exploitation of space and nuclear energy, remains a weak link in their bilateral relations. In 2012, bilateral trade between Russia and India touched $11 billion ($8 billion in Russian exports and $3 billion in imports). However, in 2013 trade turnover rolled back to $10 billion. India is the 18th in the list of Russia’s major trade partners while the US, China and the EU are top trade partners for India. This poor development of the trade and economic relations can be explained by the low interest of the Russian business to placing operations in the Indian market. This in its turn is due to the low awareness of the Indian economic potential which has significantly increased over the last few years. Cooperation opportunities in such areas as agriculture, pharmaceuticals are poorly realised or not realised at all, as well as joint ventures in hydrocarbon production in Russia and third countries with subsequent shipment to India and world markets. Linking the Indian potential in software with software equipment exports from Russia, project management in civil aviation and automobile manufacturing also get little attention. However, it should be pointed out that both sides have recently made effort to boost trade and economic cooperation. Indian companies participate in the Sakhalin-1 oil and gas project with a $2.7 billion investment. Healthcare products and medicines account for about a third of Indian exports to Russia. Indian pharmaceutical firms could participate in the technical upgrade and modernization of the Russian pharmaceutical industry. There is an agreement on a joint project to build a steel plant in India with a capacity of 2 million tonnes annually. The production of Russian Ural trucks has been set up in India. New energy units are being constructed as part of cooperation in the expansion of the Kudankulam nuclear power plant capacities. Nevertheless, it’s impossible to ignore the complex problems which came up in the bilateral military technological cooperation. They were mostly due to the state of the Russian defence industry complex which was partially affected by the collapse of the USSR and cuts in the defence expenses budget in Russia. As a result, the delivery of the INS Vikramaditya aircraft carrier, a modernised aircraft carrier Admiral Gorshkov, was dragged out. Muchkund Dubey adds, “Russia is the most important and reliable partner for India in the defence industry.” In general, the potential of the Russia-India cooperation is considerable. Indian experts are unanimous in the opinion that the accession to power of the National Democratic Alliance led by Narendra Modi won’t change Delhi’s intentions of fostering partnership with Russia, and the countries will continue cooperation in various areas. Such an optimistic approach has good grounds since Moscow’s and Delhi’s national interests do not contradict each other and mostly coincide. Alexander Panov is a former Deputy Foreign Minister of Russia. He served as Russia’s Ambassador to Japan, the Republic of Korea and Norway.